Qww, we aren't sure who to root for. Maybe the birdies, though the kitten is so cute. BOL funny cat fart. Have a terrific Tuesday. The kitty looks more interested in the birdie conversation than to eat them. Hee hee. Hehe it's like a cute little ninja kitty! What? 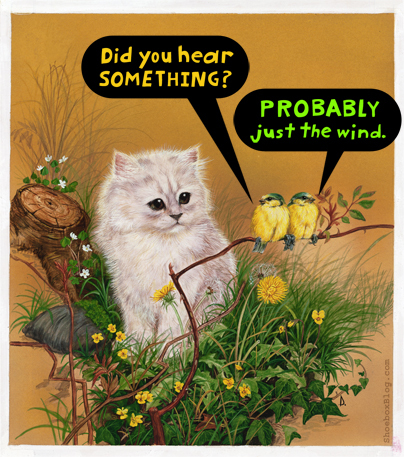 The cat broke wind? MOL! Uh oh, run away birds quick!! I think it will end well for the kitty... om nom. Hahameow...Kitty Poots, indeed! Or, Teri tastefully said...purring! haha, talk about clueless. Cute art. Yes, that big white fluff ball is probably an abnormal looking cloud.